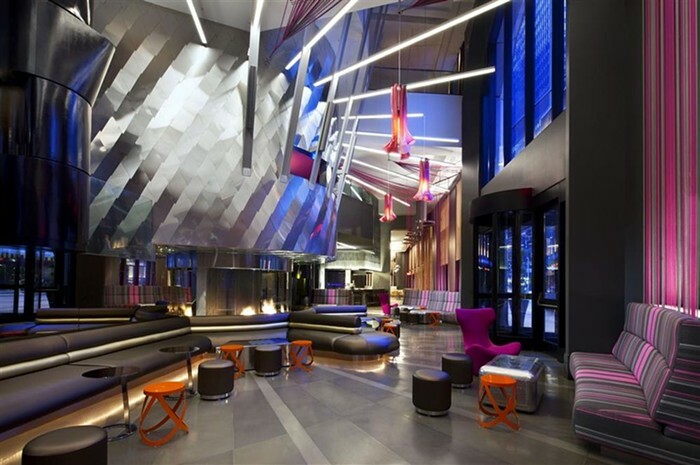 The swank W invites you to "lounge in the Living Room, our main floor with a jaw-dropping, three-story fireplace covered in nearly 1,000 stainless steel tiles and topped by a DJ booth as its centerpiece for music Wednesday-Saturday. Check your email at the large community table using our complimentary high-speed Wi-Fi, peruse the 22-foot tall graphic record collection that papers a corner of the room or perch your cocktail and savor sushi from the comfort of our metallic banquettes and aviation-inspired tables." Happy Hour Mon-Sat 3-8 pm ($6 Whiskey Sour, $10 Manhattan, $5 Microbrews, $6 house wine, $7 wells, $4, $5, and $6 food items Daily 3:00pm-8:00pm).